Notes: See first opinion for title notes. In school, they were best friends. And they shared two passions: the plane they built together, christened Bella Ciela, and a girl. Sayuri. Oblivious to the tense international environment, the three form an indelible bond and it seems nothing can ever come between them and their dream. The boys believe that someday they will reach the distant tower--and touch Sayuri's heart--however far away it may be. But time passes. War escalates. Alliances are changed. Friends become enemies. And Sayuri falls into a dreamlike state that seems inexplicably linked to the mysterious tower of their youth. At the brink of a World War, Sayuri seems to be the key to a new world peace... or a frightening and bitter end to life as we know it. When I first saw Makoto Shinkai's Voices of a Distant Star, his debut production created entirely on a single Mac, I was left stunned, touched, and, dare I say revived by the little OAV. Never had a science fiction production been able to carry such a timeless message and beautiful story of love within an equally formidable futuristic setting. With The Place Promised in Our Early Days, Shinkai returns to the anime scene (now accompanied by a small staff of trusted artists), this time with a movie length, 90-minute feature. And let me tell you, he can still work his magic. In Place Promised, Shinkai again takes us to the near future, a setting we see a lot in anime. However, as he did in Voices, Shinkai rises above many science fiction visionaries by not just dreaming up the mecha and the skyscrapers, the airships and military labs. No, Shinkai remembers that throughout all of human history, there has always been love, and will always be love, no matter how far science comes. And with love, inevitably, comes unfulfilled promises and crushed dreams. THAT is the story Shinkai is really telling (although the futuristic world he has designed is commendable in its own right). And how wonderful this story is. The star-crossed lover theme of Voices is definitely carried over here in the characters of Hiroki and Sayuri, but with Takuya as part of their trio (and of course, any trio with one girl and two guys means a love triangle, if only a subtle one). With these three youths, Shinkai explores themes of fulfillment, promise, commitment, childhood dreams, change, nostalgia, war, trust; and above all, unforgotten love and friendship. While that was probably the sappiest sentence I've ever written, this anime really isn't that at all. While it certainly is sweet, it is not treacly sweet (believe me, if it was, I wouldn't be giving it such a high star rating). Another wonderful aspect of the storyline is that, on one entirely different level, it is an enticing military sci-fi suspense action thriller (I could probably have said that all in one word, but you get the idea). An action fan could watch this and be duly satisfied. Believe me, an anime that draws in the afternoon soap-opera crowd AND the action junkies is a pretty amazing thing. Visually, The Place Promised in Our Early Days is a wonder; not only because of the beautiful art, but also because once again, Shinkai has done amazing things with seemingly limited resources (and having a staff to help him makes Place Promised even more visually polished than Voices, if that's even possible). The music plays almost continually through the feature, ending in a dazzling vocal piece, and adds to the quaint serenity of it all. Considering composer/music director Tenmon sort of came out of nowhere, it's striking how original and memorable his compositions are (definitely an anime composer to watch ... look out Yoko Kanno, Joe Hisaishi, and Kenji Kawai). With much wealthier studios creating visually crude stuff, complete with drab "music", people really need to see what can be done with almost no resources if only the creators care about every little detail in their heart (as Shinkai and the folks at CoMix Wave obviously do). 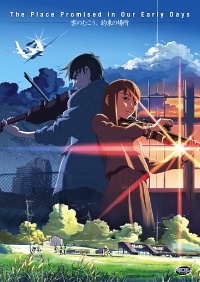 While The Place Promised in our Early Days exceeds expectations in many ways, its main joy is that it is just a wonderful, wholesome, inspirational, and extremely memorable movie to watch (in other words, it's just GOOD). I plan to watch it numerous times, just because it makes me feel so great inside (last cheesy line of the review, I promise). While this would still definitely be classified as an independent production, it is the one anime I have my eye on above all others at the moment. Because with this film, Shinkai has assured me that the anime industry, as a serious storytelling medium and not just an excuse for fan service, is safe in his hands. And with seemingly more and more turkeys around every corner of the industry, coupled with the not-so-far-off retirement of the likes of Hayao Miyazaki, that's a pretty nice assurance to have. Recommended Audience: This anime deals with fairly mature themes throughout - not inappropriate at all, just sophisticated. There is also some violence, and some rather depressing moments. While the themes of this film may go over the heads of some younger audiences, this really should be fine for most.